Scenic designer Matthew Smucker captures the austere conditions of early Salem with his stark set. When we enter, we see the stage has one lonely ghost light dimly lighting a scattering of wooden chairs and planks, sawhorses and one foreboding metal scaffold. A large black wall stands behind the clutter. The partitions of the opening scene are only indicated by a seemingly hastily drawn chalk outline. The use of chalk will be a crucial ingredient for the dramatic doings soon to unfold. When the actors enter, costume designer Deb Trout has them wearing plain clothing in generally modern styles with slight hints of an earlier historical era. Lighting designer Geoff Korf takes his cue from Miller’s line describing “the black of some terrible night.” Dark shadows interrupted by eerie rays of piercing light fill the stage throughout the evening. The sanctimonious Reverend Paris, wonderfully portrayed by MJ Sieber, has caught his niece Abigail dancing with a group of teenage girls in the woods. They have been involved in some kind of black magic. Afraid of a severe punishment from the Reverend, the girls lay the blame on Paris’ maid Tituba (the talented Shermona Mitchell). The opening incident triggers an avalanche of accusations and betrayals that nearly tear down the entire community. 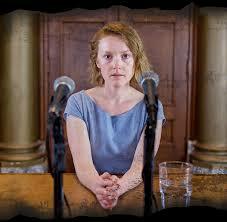 Sylvie Davidson does a remarkable job of bringing Abigail alive. The young girl is devious and malicious and could easily elicit a one-note performance. Davidson finds a greater depth here, denoting the anguish Abigail must feel. Orphaned at a young age, she had become involved with the married farmer John Proctor. Still deeply in love, Davidson embodies a young soul simply out of her depth, suffering in the stiflingly pious Puritan village. Though Abigail’s actions will become vindictive and terrifying, Davidson never lets us forget she is a girl in pain. Emilie Hanson, Hannah Mootz and Claudine Mboligikpelani Nako bring a great deal of skill and energy portraying the youngsters that have befriended Abigail. Their opening séance, overseen by choreographer Amy O’Neal, effectively ignites the ensuing drama. The true source of the Salem girls’ bewitching may never be fully understood by historians, but the ecstatic reactions the young actresses portray are nearly palpable for ACT’s audience. The voice of reason in the claustrophobic chaos of Salem is embodied in Miller’s protagonist, John Proctor played by Paul Morgan Stetler. Proctor is still confused and tormented by his act of adultery with Abigail, but he is sensible enough to see that the cries of witchery led by Abigail are all pretense; a sign of “the silly season” that is about to befall his village. He is a common man that will soon be thrown into uncommonly demanding difficulties. Stetler is able to nurture the slow burn that will later explode into a heroic passion as Proctor tries to stem the intractable madness initiated by the girls. Avery Clark is Reverend John Hale, a respected religious leader and an expert in Satanism. Clark expertly plays out Hale’s character arc, as the Reverend awakens to the evils that can hide in sanctimonious surety. William Hall Jr. brings a bit of comic relief portraying the cantankerous farmer Giles Corey. Stage veteran Kurt Beattie is Judge Danforth in charge of overseeing the trials. He is a seemingly well-intentioned man trapped in a political nightmare. In the program notes, Langs states he was committed to “connecting the play as specifically as possible to our own time and to delivering its power simply.” The director achieved his goal on so many levels. Though Arthur Miller may have been chiefly concerned with the mid 50’s Red Hunt when writing this play, his examination of the tragic outcomes of what may occur when a society is influenced by hysterical prejudice speaks to us today. The ACT production of The Crucible ensures that the play’s messages and themes are delivered most powerfully.